This article will cover Disk Management tools that are available in Windows XP Professional. 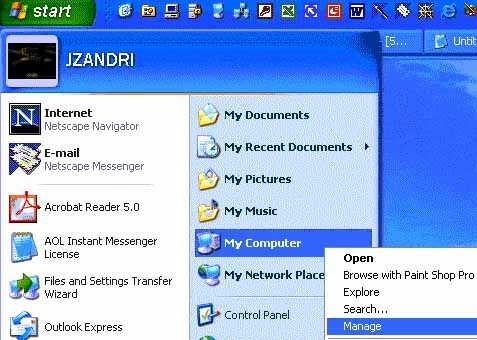 In Microsoft Windows XP Professional, you can perform most disk administrative tasks, both local and remote, by using the Microsoft Management Console (MMC) snap-in tool called Disk Management. A command-line tool, DiskPart, is also available in Windows XP Professional which allows the administrator to handle disk administrative tasks from a command prompt. You can use both tools to convert disks, as well as format current partitions and unallocated space. You can also check on the status of fixed and removable disks and their associated properties. Normally, you will need to be a local administrator to perform most system configuration functions (even just taking a look at the current configuration settings) on a Windows XP Professional system, and in some cases, there may be a local policy set by some other administrator or if your system is in a Domain, a Domain policy setting which may prevent you from performing some actions. The command line tool, DiskPart, is available in Windows XP Professional, which allows the administrator to handle disk administrative tasks from a command prompt. /? - Show this help screen. ACTIVE - Activates the current basic partition. CLEAN - Clear the configuration information, or all information, off the disk. CONVERT - Converts between different disk formats. HELP - Prints a list of commands. IMPORT - Imports a disk group. LIST - Prints out a list of objects. REM - Does nothing. Used to comment scripts. RETAIN - Place a retainer partition under a simple volume. SELECT - Move the focus to an object. For the most part, this command line tool is highly effective when you are using any of the above commands via scripting. The only other time it is easy / necessary to use it, is from the Recovery Console, as it is one of the commands that are available from it. To exit the DiskPart program simply type EXIT at the program prompt. The Diskpart Command Line Utility is available for download from Microsoft for Windows 2000 and it is part of the Windows 2000 Resource Kit Tools as well. (It is included as part of Windows XP Professional and Windows Server 2003.) As with any software available for use from any version of the Resource Kits or the download site, it is not supported under any Microsoft standard support program or service. You use it at your own peril.